What in the name of the stars is a Dobsonian telescope and why should you care when searching for your perfect telescope? Once a field that could only be studied by scholars and the wealthy, astronomy has made leaps and bounds in ensuring that star-gazing could be accessible to anyone who wanted to do it. If you are reading this, then that means you! Buying the perfect telescope for your needs is incredibly important and we are here to help! In this buying guide we introduce you to Dobsonian telescopes and discuss what we feel are the top 5 best Dobsonian telescopes. First, let’s go over what a Dobsonian telescope is. Dobsonian telescopes are a kind of portable telescope named after the ‘Father of Sidewalk Astronomy’ John Dobson who popularised a portable telescope mount. The technical term for this mount is altazimuth, which just means that it allows the telescope to move up and down and from side to side with relative ease and simplicity. Dobson wanted to make it so that anyone could make and use their own telescope if they wanted. What are now considered Dobsonian telescopes are not made by Dobson, but still support the idea that telescopes should be accessible, easy to use, and portable. Most of these combine Dobson’s mount with a Newtonian reflector which use two mirrors: one that is spherical to catch the lights and images from the sky, and the other which is a flatter oval to reflect those images through the telescope for us to see. If you look at a Dobsonian telescope, you may notice that it isn’t long and thin like what you might imagine a telescope to look like. The diameter (or aperture) is bigger which makes it easier to look at the deep sky and see things farther away. This is because a larger aperture gives the telescope a better ability to capture light. What To Look For in a Dobsonian Telescope? Why You Should Choose a Dobsonian Telescope? Why You Shouldn’t Choose a Dobsonian Telescope? There are several things that make for a good Dobsonian telescope and some key terms that you need to know in order to make an informed telescope purchase. To make this easier for you, we have listed them here. Aperture (or diameter of a telescope’s primary lens) is important to consider when purchasing any telescope—Dobsonian included. The larger the aperture, the more you can see. Unfortunately, the larger aperture also comes with a higher price tag and weight. However, the exciting news is that even, say, a 4-inch aperture can collect 204 times the amount of light that your eye can! Remember that aperture is separate from how magnified objects are—a 2-inch telescope and a 4-inch telescope with the same magnification will have the 4-inch show the object more clearly. The focal length of a telescope is the distance between the primary lens and where the light comes into focus. This gives you insight into how much magnification a telescope can handle. Dobsonian telescopes are very interesting because, while they don’t have the highest magnitude available in a telescope, the aperture in Dobsonians means you can see larger parts of space fairly well without adjustment (telescopes with larger focal lengths show things more clearly but tend to show smaller areas). The mount in a Dobsonian telescope is an altazimuth so it can move up and down and side to side. The mount needs to situate the telescope so that it can move easily but also not move so easily that it doesn’t stay where positioned. The mount also needs to be sturdy. Dobsonians are meant for people to use in their backyards or lugged to star-gazing parties so need to be able to withstand being moved constantly and being exposed to the elements. A good Dobsonian telescope needs to be portable so that you are not limited to just your backyard. Make sure though that you go for a telescope that you can transport it safely without injury. If you’ll be sky-watching by yourself and you have a bad back, perhaps one of the larger motorised Dobsonians would not be the best fit for you! Dobsonian telescopes are suitable for a wide variety of people who have different ideas on what they desire in a telescope. Because ‘Dobsonian’ primary refers to the mount, there are many different subsets of Dobsonian telescopes for different needs such as astrophotography and viewing Deep Sky Objects. Dobsonian telescopes are good for both people who have no idea their level or field of interest and people who can tell you Earth-loads more about telescopes than we ever could. A more simplistic Dobsonian lets you point to the sky and manually switch what you are looking at with ease. If you don’t know what precisely you are interested in seeing or want to be able to try astronomy without breaking the bank, this is an excellent choice. More sophisticated Dobsonians can have technology that assists you in more easily finding what you want to see. Say you saw a cool picture of a star but you have no idea if it is visible where you are or even in what direction to point—it can find it for you! For more advanced astronomers, some Dobsonians have tracking software so that you can take those incredibly stunning pictures that you see professionals take of the night sky (this is called astrophotography). The primary reasons that would make a Dobsonian telescope an unfit choice are its weight and size. While all telescopes weigh different amounts, Dobsonians can weigh over 80 pounds! If you live in a building without an elevator or have issues with heavy lifting, then perhaps a Dobsonian would not be right for you. Related to that is the size. Even though Dobsonians are marketed as portable – and they are—they are not tiny and need a substantial amount of space when travelled with. We know that a lot of people have to rely on public transit and it could be frustrating to lug something this heavy from station to station. Skywatcher telescopes such as the SkyWatcher S11820 GoTo Collapsible Dobsonian are created to appeal to a large variety of people. The GoTo function in this telescope means that you can use the Syncan software and easily find and track any of the over 42,000 objects in its database. This means that budding astronomrs can have assistance finding the objects they want to see, and more experienced astronomers can more easily switch between the objects they wish to track. The SkyWatcher S11820 is accompanied by a hand controller so that you do not have to physically readjust the telescope—but if you want to do it manually it’s great for that too! Due to the tracking software, this telescope is also great for astrophotography! 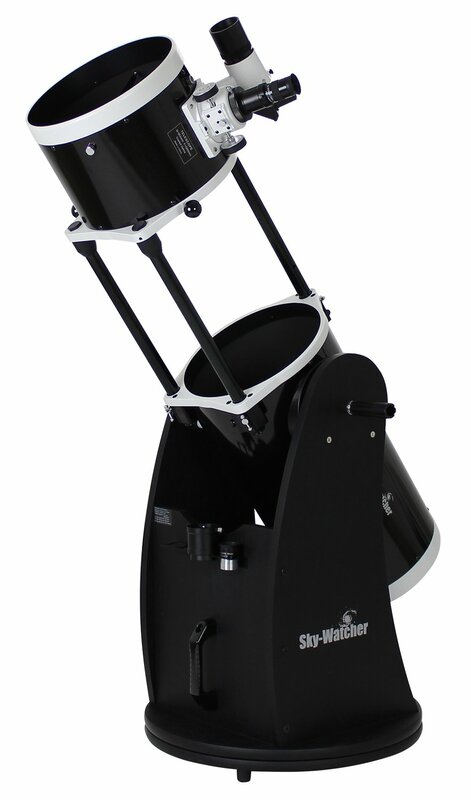 The SkyWatcher S11820 GoTo Collapsible Dobsonian is a great choice for someone who already knows they are interested in astronomy and wants to be able to identify Deep Sky Objects or someone who is fascinated with astrophotography. While this is the most expensive telescope we are listing here, we feel that it is worthy of the investment! Weight: It weighs almost 95 pounds! 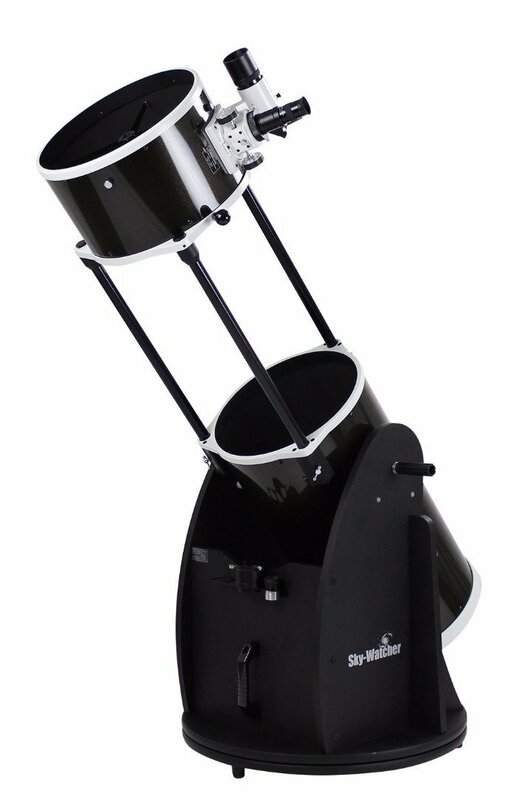 The Orion 10024 SkyQuest XX14i IntelliScope Truss Dobsonian Telescope is a stellar option for astronomers who want the option of being able to manually and mechanically control their telescope. 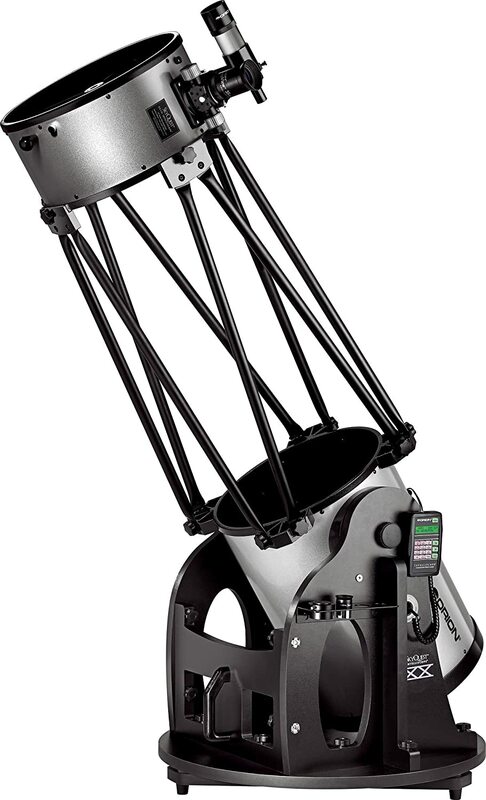 Unlike some of the other computerised telescopes, the Orion 10024 SkyQuest XX14i IntelliScope Truss Dobsonian Telescope has a truss system which means that it is collapsible and easier to transport. The Starry Night software has over 14,000 celestial objects in its database and the IntelliScope can show you exactly where they are! The Orion 10024 SkyQuest XX14i IntelliScope Truss Dobsonian Telescope is a well-designed telescope that can show you the beauty of space and tell you what it is you are looking at! The large aperture means you can see celestial beings beyond your deepest imaginings. Shows clusters such as Messier 13 with ease! The Meade Instruments 1005-05-03 LightBridge 10-Inch is a telescope so well made that it can even take on the nemesis of all astronomers: light pollution. This telescope is capable of showing celestial objects even in rural areas! The LightBridge 10-Inch is a wonderful choice for anyone who wants to direct the telescope themselves, but also have access to software to help with identification. 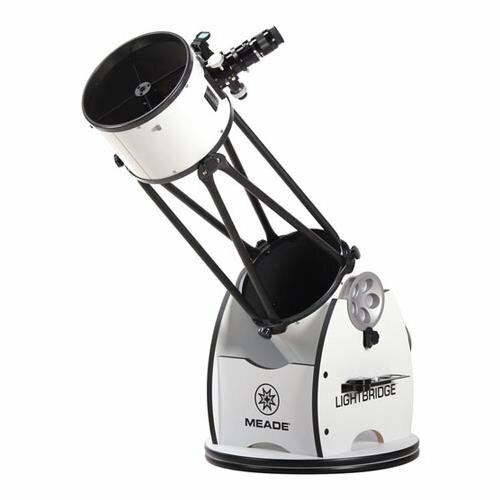 The Meade Instruments 1005-05-03 LightBridge 10-Inch is an effective telescope for beginners learning how to see the planets and moons, but also more advanced astronomers who like to be able to set up quickly and see objects even in the middle of a city. The Sky-Watcher 10″ Collapsible Dobsonian Telescope is priced to seem like a mere beginner’s telescope but there is more to it than meets the eye. Not only is this telescope capable of showing you the planets, it can also show Deep Sky Objects with breath-taking clarity. The Sky-Watcher 10″ Collapsible Dobsonian Telescope does not need to be disassembled but can be to make carrying it easier. If you are someone who wants to smoothly do the work of star-gazing and identifying themselves without computerised assistance, this telescope may be a wonderful fit! The Sky-Watcher 10″ Collapsible Dobsonian Telescope is an effective telescope for anyone who wants to look at celestial objects near and far with ease. The trusses mean that the telescope is lighter so that it can be taken to wherever the sky calls you to. The Orion SkyQuest XT8 Plus Dobsonian is the perfect telescope for budding astronomers! 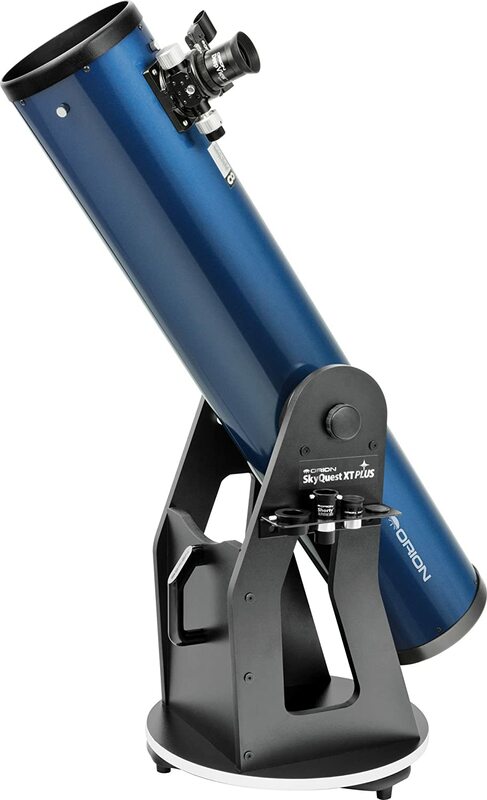 This telescope comes in a fun blue design and is our favourite Dobsonian telescope under $500. The Orion SkyQuest XT8 Plus Dobsonian is capable of introducing you to all the wonders of universe and is the perfect way to see if astronomy is right for you. It is capable of beginner astrophotography and is still usable in light-polluted areas. For people who want to do more than just general star-gazing this telescope may be a bit simplistic, but for everyone else this is the perfect foray into universe around us. The Orion SkyQuest XT8 Plus Dobsonian is a wonderful device for beginner astronomers and people who just want to star-gaze casually. It is relatively light-weight with a price that makes it very accessible to those who have a hankering to see the universe around us in new ways. For computerised telescopes you will need to be able to recognise a couple objects so that the telescope can be aligned properly. Only clean the mirror if absolutely necessary—telescopes can handle more dirt than you’d expect and taking them apart to clean can potentially void the warranty. To clean an eye piece, lightly brush it with a camel hair brush—do not touch it with your fingers! We hope that this buying guide helps you understand what a Dobsonian telescope is and why we love them so much! They truly are the ideal telescope for so many people: beginners, more advanced users and even astrophotographers. There are so many telescopes – Dobsonian and otherwise—on the market these days but we feel that these 5 illustrate what a good Dobsonian is and the different attributes they can have. Remember that Dobsonian telescopes were invented so anyone could make a telescope and explore the universe without price being a deciding factor. In the words of Dobson himself: “It is up to the amateurs to bring astronomy to the people, to get individuals really interested in astronomy…”. So get out there and show the world the wonders of the universe! Want to learn more? Please look around our site: it is catered to people just like you! We have resources for cameras to use for astrophotography as well as just cool facts if you are a bit space nerdy like we are.